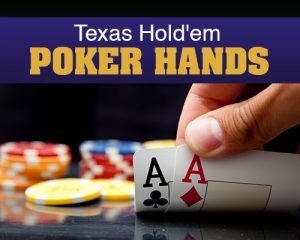 Texas hold’em is the most popular of all poker variations. Each player is dealt two hole cards in Texas hold’em with the overall goal of making the best five-card hand. Play moves clockwise around the table, starting with action to the left of the dealer button. Generally, the first two players to the immediate left of the button are required to post a small blind and a large blind to initiate the betting. From there, action occurs on multiple streets: preflop, the flop, the turn and the river. The following list is from best to worst poker hands, so any hand on the list beats any hand below it and loses to any hand above it. Royal Flush – An Ace-High straight of one suit. Straight Flush – A straight of entirely one suit. Four-of-a-Kind (Quads) – Four cards of the same rank. Full House (Full Boat, Boat) – Three-of-a-kind and a pair. The example below would be called “Queens over Aces” or “Queens full of Aces”. Straight (Run) – Five cards of sequential rank. Note that in holdem, Aces can be high or low. Three-of-a-Kind (Trips, Set, Triplets) – Three cards of the same rank. Two Pair – Two cards of the same rank and another two cards of the same rank. The example below would be called “Jacks and Twos”. High Card – When you don’t have any of the above, your highest card determines your hand. The example below would be “King High” or “High card King”.